This year's report, published under the theme "Beyond the downturn", reflects the cautiously optimistic outlook and many complexities still facing the industry, which must be overcome to ensure the sector's strong growth in the future. This is particularly captured by the topics covered in the analytical chapters, exploring issues such as the impact of the recent economic and financial crisis on the tourism industry, the importance of price competitiveness for attracting tourists, and the important role to be played by travel and tourism in the emerging green economy. South Africa has slipped to 66th place (ranked out of 139 countries) in the 2011 report as compared with 61st place (ranked out of 133 countries) in 2009. "Our report measures the many factors that make it attractive to develop the travel and tourism industry of individual countries," said Jennifer Blanke, lead economist and director of the World Economic Forum's Centre for Global Competitiveness and Performance. "The top rankings of Switzerland, Germany, France and Austria demonstrate the importance of supportive business and regulatory frameworks, coupled with world-class transport and tourism infrastructure, and a focus on nurturing human and natural resources for fostering an environment that is attractive for developing the travel and tourism sector." This cross-country analysis of the drivers of competitiveness in travel and tourism provides useful comparative information to make business decisions and to add value to governments wishing to improve their travel and tourism environments. 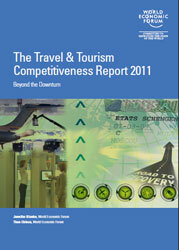 The rankings are based on the Travel & Tourism Competitiveness Index (TTCI) covering 139 countries. The TTCI uses a combination of data from publicly available sources, international travel and tourism institutions and experts, as well as the results of the Executive Opinion Survey, a comprehensive annual survey conducted by the World Economic Forum together with its network of partner institutes (leading research institutes and business organizations) in the countries covered by the report. The survey provides unique data on many qualitative institutional and business environment issues. The last part of the report contains detailed country profiles for the 139 economies featured in the study, providing a comprehensive summary of their overall position in the Index rankings, as well as a guide to the most prominent travel and tourism competitive advantages and disadvantages of each. Also included is an extensive section of data tables covering each indicator used in the Index's computation. "Following a period of severe economic turmoil, the travel and tourism industry is now beginning to see positive signs of recovery, especially in the emerging markets of Latin America, Asia and especially China", said Thea Chiesa, head of Aviation, Travel and Tourism at the World Economic Forum. "In order to succeed in the new reality that has emerged from the crises, however, the T&T industry and destinations need to change the way they operate. Through new business models, alliances and partnerships, they need to address social inclusion and manage risks (especially security and environment) in a holistic and systemic manner." "For five years, the World Economic Forum has engaged key industry and thought leaders through its Aviation, Travel & Tourism Industry Partnership Programme to carry out an in-depth analysis of the travel and tourism competitiveness of economies around the world. The goal is to construct a platform for multi-stakeholder dialogue to ensure the development of strong and sustainable national travel and tourism industries capable of contributing effectively to international economic development," noted Robert Greenhill, chief business officer of the World Economic Forum. The World Economic Forum produced the report in close collaboration with its strategic design partner, Booz & Company, and its data partners, which included Deloitte, the International Air Transport Association (IATA), the International Union for Conservation of Nature (IUCN), the World Tourism Organization (UNWTO) and the World Travel & Tourism Council (WTTC). The Forum also received important feedback from a number of its key industry partners in the effort, namely Airbus, Bombardier, Etihad Airways, Gulf Air, Hertz, JetAirways, Jumeirah, Silversea Cruises, Rolls-Royce, Swiss and VISA. Several thought leaders from these organizations contributed insightful papers addressing various aspects of travel and tourism competitiveness.